TALLAHASSEE, Fla. — Low wage workers at Monday's rally said the bottom line is if you're making less than $15 an hour, you simply can't afford to live here. Bobby Fields has worked at McDonald's for 11 years. He recently got a promotion to become a crew trainer and now makes $9.30 an hour, which he says isn't fair. "It not only barely pays my bills but it doesn't help much getting the essentials I need for my family, food, being able to washcloth and important things that we need, utilities to keep my household up to par and maintained," said Fields. He said he feels like he has to sacrifice taking care of himself to try to care to his family. He says raising the wage to $15 an hour will be a life-changer and he'll be able to pay his bills and validate his hard work. "At $15 dollars an hour, at 40 hours, I feel like I've done a job well-done. I deserve to take care of myself," said Fields. Gail Rogers came to the rally from Tampa to send a message to legislators. The message is that she is struggling, trying to get by on a food service job that pays her $8.95 an hour. She is 59 years old and rides a bike five miles to work and back and lives in a rooming house. "I'm struggling, if it wasn't for food stamps every week I wouldn't eat. I'm living from one paycheck to another every two weeks," said Rogers. "Once I pay my rent I don't have anything to wash my cloths or take me to places I need to go." Despite the struggle to make ends meet, the people we spoke to said they are optimistic. "The minimum wage is going to go up to $15," said Rogers. "We all just need to come together, come together on one accord." 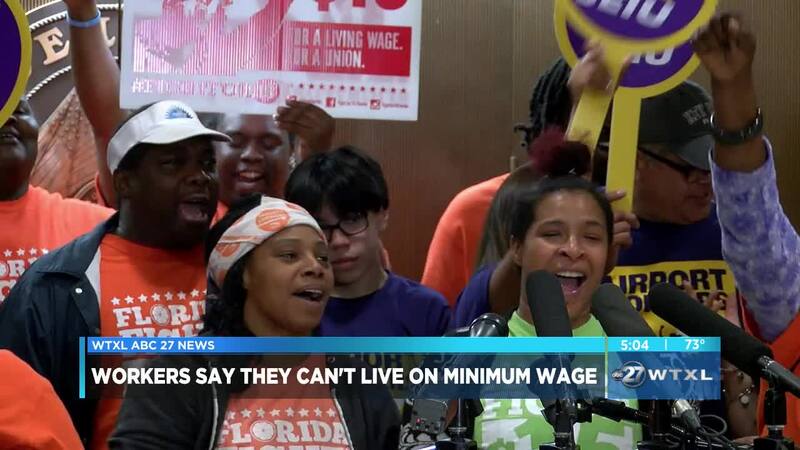 A new study by the Economic Policy Institute said raising the minimum wage will boost the economy for over three million Floridians, benefit local economies, and lower costs to public programs.